Originally published under the title "U.S. Strikes in Syria: This Isn't Regime Change (But It Might Be)." The cruise missile strikes on Shayrat air base in Syria were a well-calibrated response to the Assad regime's latest chemical weapons attack, provided they do not pave the way for broader military intervention. "The American strike is the beginning of the procedures to remove Assad and bring him to trial." So wrote Abd al-Majid Sharif, head of an opposition-backed local council in northern Idlib, in response to the US Tomahawk cruise missile strikes on the Shayrat airbase of the Syrian regime, which killed at least six Syrian military personnel. It is understandable that these strikes - the first direct US military action against the regime and punishment for the chemical weapons attack in Khan Sheikhoun - have raised hopes of a broader US policy shift against the regime among the wider opposition and their supporters. The shift is the more dramatic coming after signals from the Trump administration just days before the attacks pointed to an American acceptance of the regime as here to stay. However, the actual strike and the circumstances surrounding it currently suggest an initiative with a much more limited deterrence purpose, not broader military action to reverse the tide of the Syrian civil war's main conflict: that is, the conflict between the regime and the insurgency/political opposition, a war that is presently in favour of the regime. Clearly, seeking to avoid a direct confrontation with the regime's Russian allies on the ground, the US military appears to have tipped off their Russian counterparts in advance. If the goal of the strike does, in fact, have this limited deterrence purpose, then it amounts to a rational and well-calibrated response. Besides reducing the absolute number of aircraft capable of bombing Syrian civilians (absolutely a good thing in its own right), the strike is useful in sending a message that international norms prohibiting chemical weapons use cannot simply be violated and merely condemned with words. Surveying the responses of the regime and its state and militia allies points to predictable anger but not a desire to launch a broader counter-escalation against the US on account of this strike alone. Instead, their actions and words suggest a strengthening-of-defences posture emphasising that Assad's Syria and his army will endure despite the strikes and that the fight against the "terrorists" will continue, with an eventual victory assured. Any threats of retaliation have only been expressed in very vague terms, as became apparent in the statement on the strike from the pro-Assad militia called the Syrian Resistance. Meanwhile, the Iraqi group Asa'ib Ahl al-Haq, which has deployed fighters in support of the regime, attempted to tie the strike on the particular airbase to the claimed downing of an Israeli aircraft in an earlier incident. 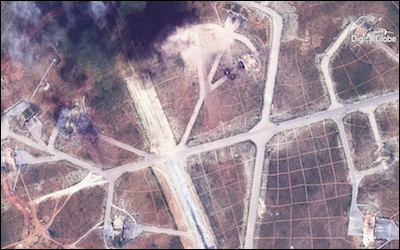 A concern has been raised that this particular strike on the airbase will allow the Islamic State (IS) to capitalise with a new offensive in the Homs desert area. However, this angle is probably being overplayed by regime supporters. IS's offensive capacities have long since been significantly weakened, and if the regime and its allies regard its fronts as a particular threat, it is for them to deal with the problem with their own air strikes. All that said, notions at this stage of trying to effect a political settlement to the Syrian civil war and transition away from Assad are in vain. This point needs to be borne in mind especially with some calls for a broader escalation against the regime, echoing the longstanding line that sufficient military pressure will bring the regime to negotiate a political transition. The regime regards Assad as its indispensable figurehead. Regardless of whether he really is indispensable to its survival, the fact that this perception exists in the regime presents an intractable obstacle to any meaningful negotiations. There is also the problem of who would represent the insurgency-held areas outside of regime control. The insurgency's main epicentre from which the most meaningful threats to the regime still emerge is Idlib province, presently dominated by the al-Qaeda-linked Hayat Tahrir al-Sham and the Salafi group Ahrar al-Sham, both of whom are considered problematic actors. Meanwhile, the Eastern Ghouta pocket in proximity to Damascus is not dominated by either of these groups but is in terminal decline on account of siege conditions and fierce factional infighting. The Daraa and north Aleppo zones are largely proxy projects of Jordan and Turkey respectively, more concerned with maintaining their own security along the border areas. The only way to bring about a real change in the government in Damascus would be through destroying the regime militarily. The only way to change Syria's government is by destroying the Assad regime militarily. Even supposing no insertion of troops on the ground, such a campaign would entail unacceptable risks, whether in triggering a direct confrontation with Russian forces, creating large swaths of newly displaced people, or greatly empowering the likes of Hayat Tahrir al-Sham. However, the volatility of the Trump administration means that a broader strategic shift in this direction cannot be completely ruled out. A sounder approach will recognise instead the need to minimise the humanitarian suffering and fall-out from the present state of the civil war. Even if it becomes totally unfeasible to repeat strikes on regime positions, the fact that the regime has fewer aircraft to attack civilians as a result of this strike is by itself a positive development. The two other main measures to be encouraged at this stage are letting into neighbouring countries more Syrians who risk being trapped by regime advances in places like Idlib, with more assistance to be provided to those countries, and keeping a firm distance from the Assad regime.